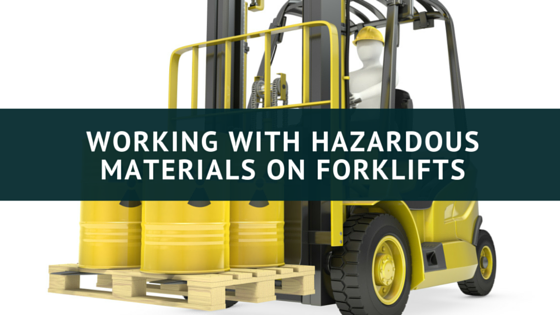 Working with hazardous materials are all too familiar with forklift operators. Moving, lifting, and transporting chemical waste and flammable materials is what makes a forklift operator’s job dangerous, especially considering accidents like spills happen every day. Employees need to be prepared to handle emergencies involving hazardous materials, and employers need to set up a communication system that reaches all areas of the worksite. What Are The Most Common Emergencies Caused by Hazardous Materials on Forklifts? The transportation of radioactive materials and chemical waste; the storage and handling of liquid fuels and petroleum gas; and the presence of carbon monoxide and other air contaminants are all examples of the hazards forklift operators face. Chemical hazards and toxic substances are dangerous to one’s health and also pose a threat to the environment if they are flammable, corrosive, or reactive. Many employees work with compressed gasses and can cause a number of hazardous situations involving oxygen displacement, fires, explosions, and exposure to toxic gas. Hazards also include operating a forklift with combustible fuel in a poorly ventilated area that can lead to the accumulation of carbon monoxide or carbon dioxide. How Can Employers Reduce The Amount of Accidents Caused by Hazardous Materials? First of all, all workers need to be trained to handle forklifts and be prepared in the event of an emergency involving hazardous materials. Employers need to implement a written plan of action all workers memorize to improve communication when notifying other workers of an emergency. Other precautions that can reduce the severity of an emergency include: handling chemical substances with care, using slash guards on equipment and always wearing protective goggles and gloves when transporting chemical goods; understanding how to fuel and refuel forklifts properly, and never operating a fuel-operated forklift in a tight space without any ventilation. Also, make sure all containers are labeled, and allow only authorized equipment to enter marked areas containing hazardous materials. Whenever employees are working in environments with insufficient oxygen, harmful dust, mists, sprays, vapors, and gasses, ensure all workers are wearing respirator masks to protect them from breathing in harmful substances. Workers operating forklifts should first and foremost be certified with OSHA compliant training. If workers understand the safety precautions, then they will be much more able to handle hazardous materials and reduce the occurrence of an emergency. The online program with CertifyMe.net offers a certification course that can be taken online and completed in as little as 60 minutes. It is 100% OSHA compliant, so employers can feel relieved knowing workers are given comprehensive training that includes everything they need to know to recognize a hazard, communicate for help, and remedy the situation. Training also includes how to assess equipment, including how to fuel a forklift properly. Forklift operators and employers need to take the necessary precautions to protect themselves and other workers from exposure to toxic chemicals and waste, because a lackadaisical approach to handling hazardous material can have deadly consequences.